All events for Geauga Park District’s Sap’s-a-Risin’! Sap’s-a-Risin’! offers visitors of all ages hands-on interaction with the process of making maple syrup. 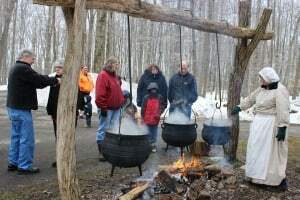 Gather sap in the sugar bush with a horse-drawn sap sled, experience gathering and boiling methods through the ages, and — of course — sample the sweet stuff.